Even before the awards for Asia's 50 Best Restaurants in March, we had gotten wind of Chef Tam Kwok Fung (譚國峰)'s impending move from Jade Dragon (譽瓏軒) in the City of Dreams to Wynn Palace. 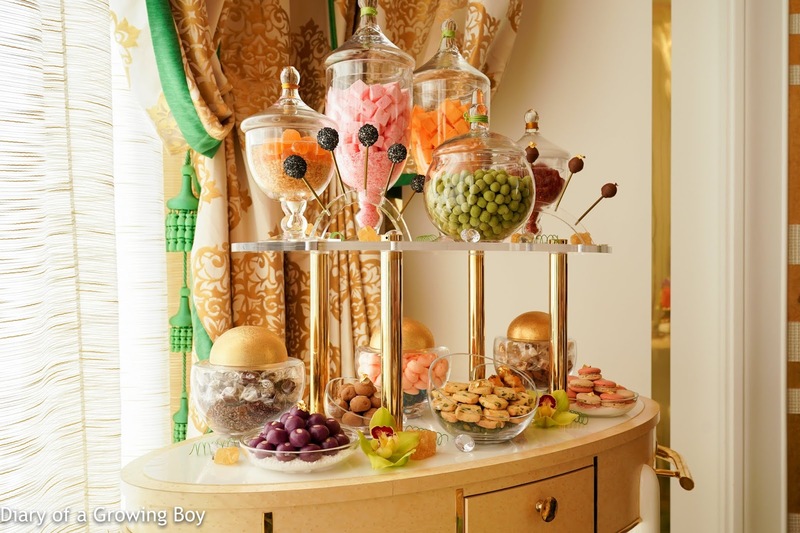 That seemed like a coup for Wynn and was seen as a sign that they are gearing up further on fine dining - especially at their premium mass market location Wynn Palace. After all, many of us are of the opinion that Jade Dragon was on its way to bagging the elusive third Michelin star. Today I finally had a chance to pay Chef Tam a visit in his new digs. As part of the itinerary arranged for my visiting friends, I asked The Man in White T-shirt to set up lunch today at Wing Lei Palace (永利宮). We also rounded up a few more people so that we could have a proper Chinese meal. Of course, Chef Tam decided to pull out all the stops for us - and started by putting us in one of the private rooms with a balcony which opened out to the Performance Lake. 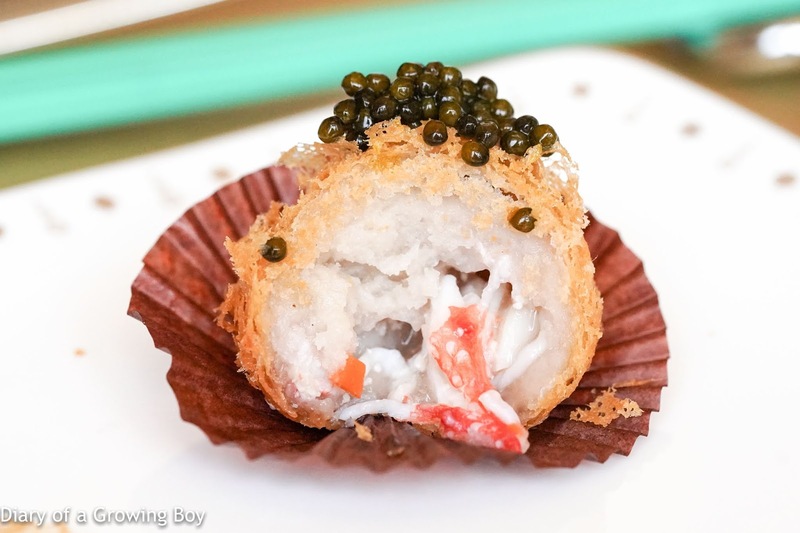 Deep-fried taro puff with crab meat and caviar - I love anything made with deep-fried taro mash, and this was no exception. 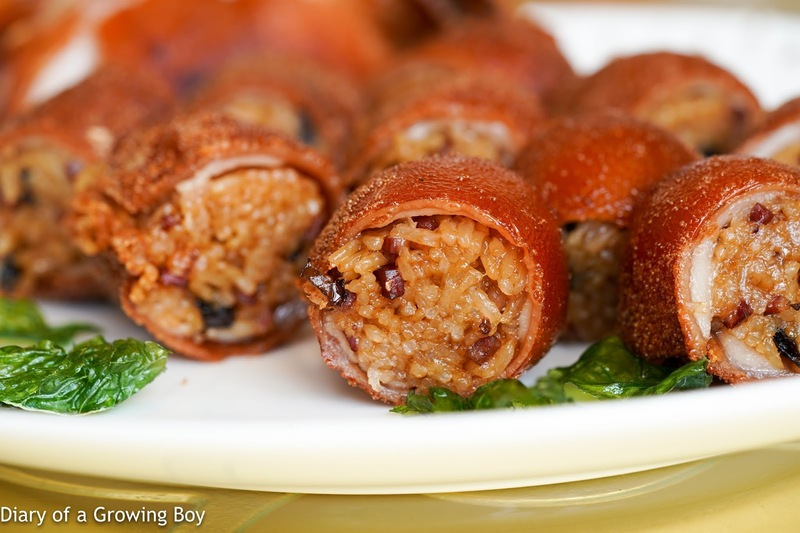 Rice flour rolls with blue lobster (藍龍蝦腸粉) - also stuffed with kailan (芥蘭) and chives, and topped with salmon roe. 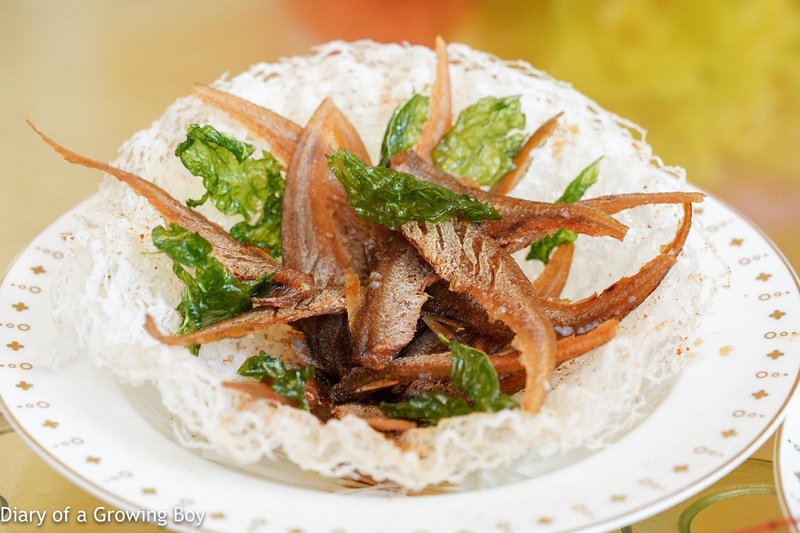 Crispy fried Osbeck's grenadier anchovies (酥炸鳳尾魚) - one of the things Chef Tam picked up from the market, and we were so happy! For some of us, this was a childhood memory. For many years the only way for me to eat these would be out of a tin can from China, and only in the last few years have I managed to come across fresh ones at a couple of restaurants. These filets were so crispy after being deep-fried. I just absolutely love them! They weren't marinated before frying, but were served with a few drops of special soy sauce. 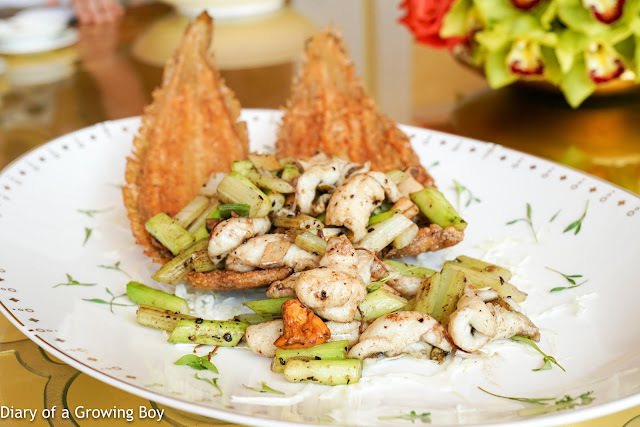 And by serving these to us, Chef Tam stayed true to his passion for seafood that was wild and local... 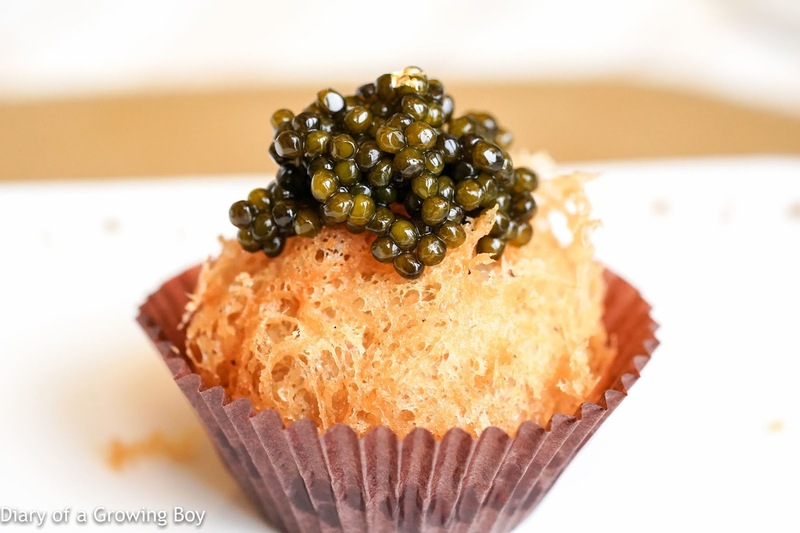 While it's easy for restaurants to put all sorts of coral fish like garoupas on the menu and charge a pretty penny for them, Chef Tam laments that this trend inevitably results in cheaper, more "local" varieties being ignored. 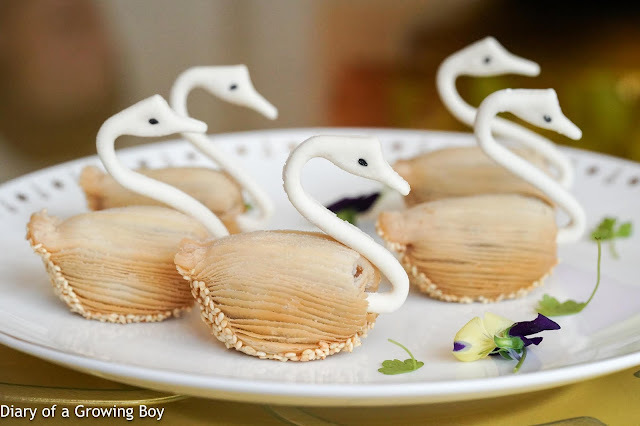 Roast goose puffs (燒鵝酥) - these were beautiful to behold, and absolutely tasty. Crispy puff pastry on the outside with a layer of sesame seed crust at the bottom. And knowing Chef Tam... his roast goose is just about second to none in Macau. 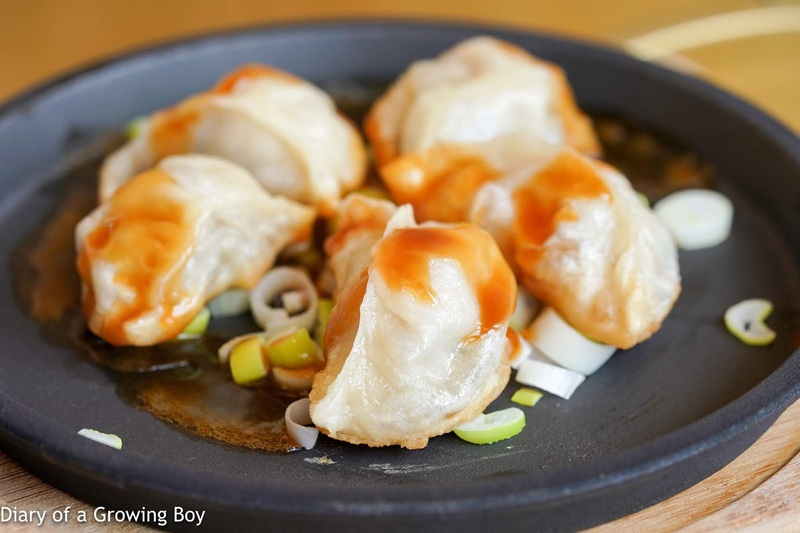 Pan-fried pork dumpling with abalone sauce (鮑汁鮮肉鍋貼) - I remember Chef Tam's pot stickers from earlier this year, with a combination of sea cucumber and minced pork filling and an abalone sauce. No black truffle on top today, though, and much less sauce than before... but still very delicious. 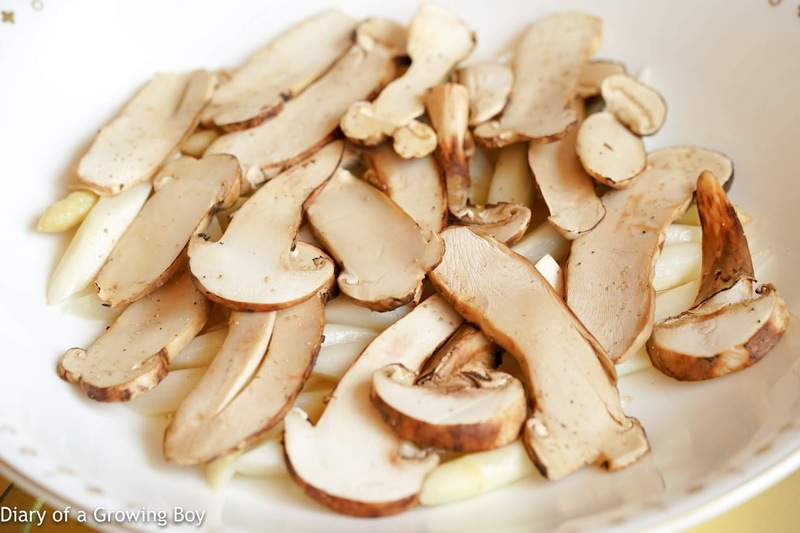 Steamed mushroom dumpling (野菌蒸餃) - the color of light green jade, the wrapper contained diced mushrooms as well as carrots, celery, wood ear fungus, as well as some crunchy roots. 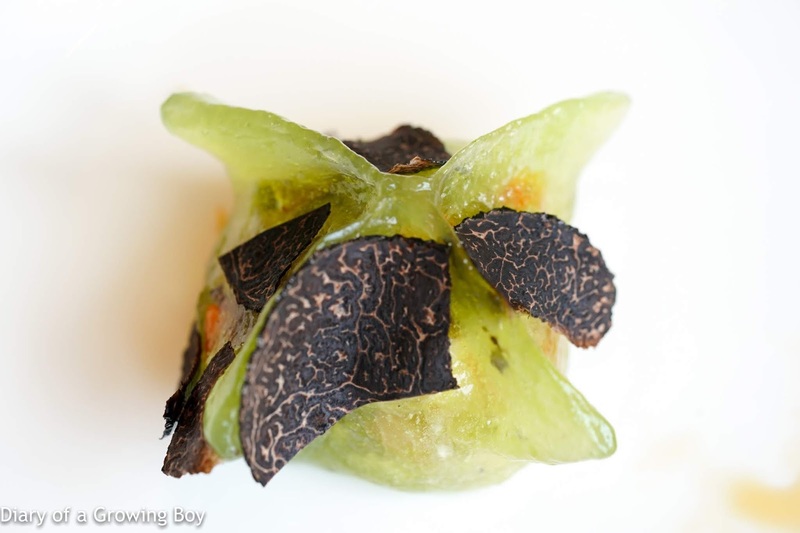 Slices of black truffle accented the dumpling well. 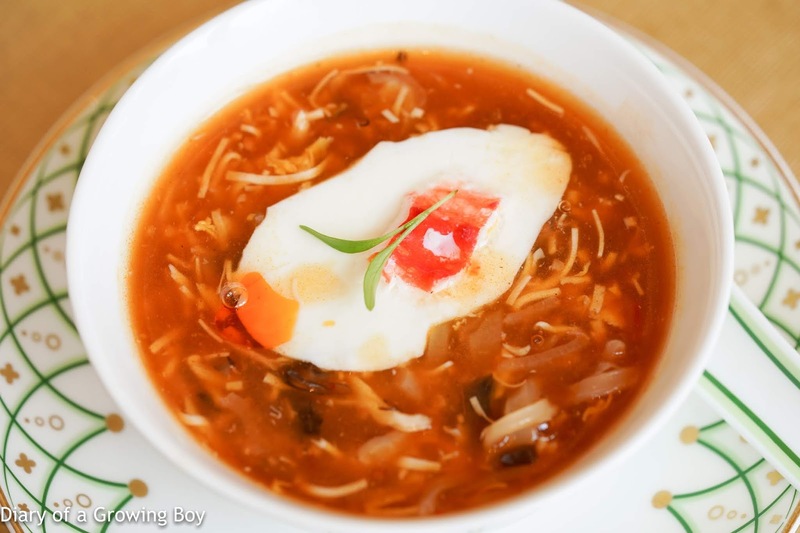 Hot and sour soup with king crabmeat (生拆帝王蟹酸辣羹) - Chef Tam's signature soup from Jade Dragon. I'm not in the habit of ordering hot and sour soup, but if I had to drink a bowl, this would be the version I'd want. Made with king crab, scallops, shredded fish maw, mushrooms, wood ear fungus, and three different types of vinegar: black, red, and balsamic. Stir-fried tonguesole with Chinese black olive (欖角炒金邊方利) - another fresh catch from the market. These were about 10 taels each, filleted and stir-fried with Chinese black olives for seasoning, along with some kailan (芥蘭), celery, ginger, and mushrooms. Very delicate flavors. The deep-fried bones were also very, very tasty. 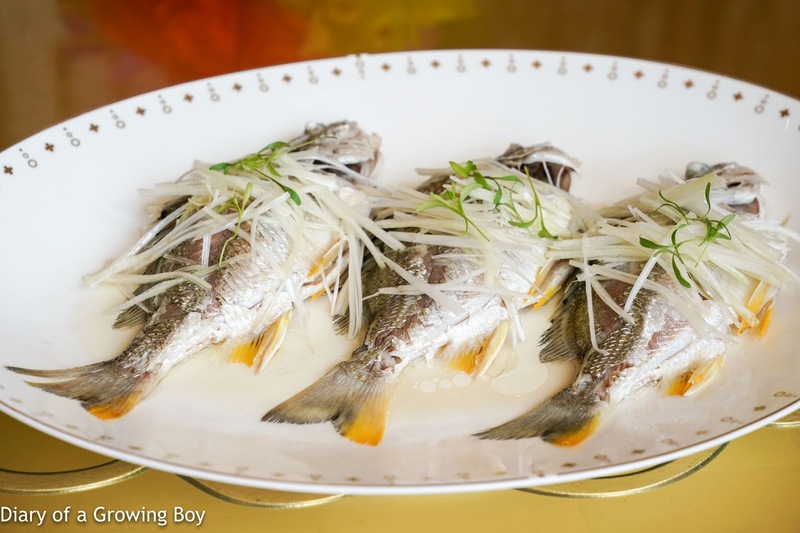 Steamed yellowfin sea bream (蒸黃腳臘) - with fresh seafood, often the best preparation is the simplest. As was the case with these. Bombay duck with loofah (絲瓜九肚魚) - I was first introduced to Bombay duck when I first came to Hong Kong more than 20 years ago, and in all this time I have never had it prepared in a way that wasn't deep-fried. This was a true revelation today. 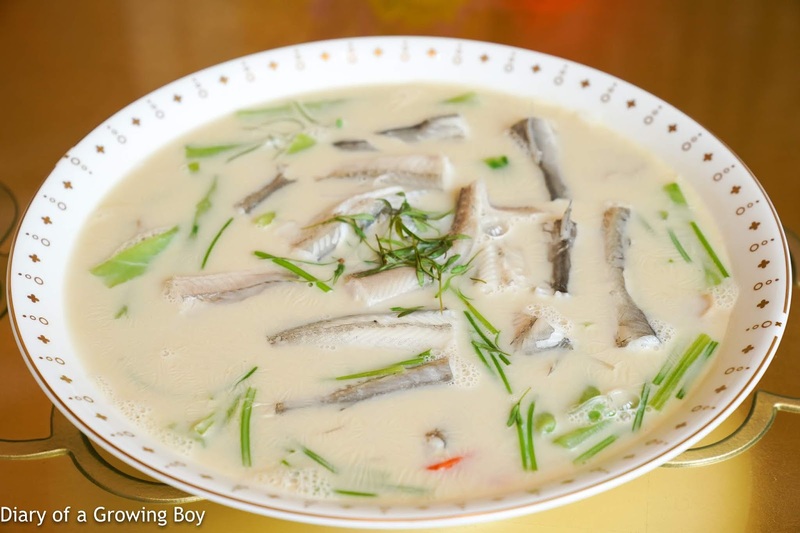 The fish came in a bowl of milky broth with loofah (絲瓜) and Chinese celery. I've always known that Bombay duck melted in the mouth, but today these tasted like someone had made Jell-O popsicles around fish bones... Was that really fish I was eating? I greedily sucked the flesh clean off the bones, and dipped on the delicious broth. White pepper was used sparingly to neutralize the fishy flavors, and I didn't mind the light, earthy flavors of loofah. This was just a whole lotta happiness in one bowl. Roasted Te Marta lamb chop with peppers - these lamb chops from New Zealand were very, very tender after having been aged for 21 days. 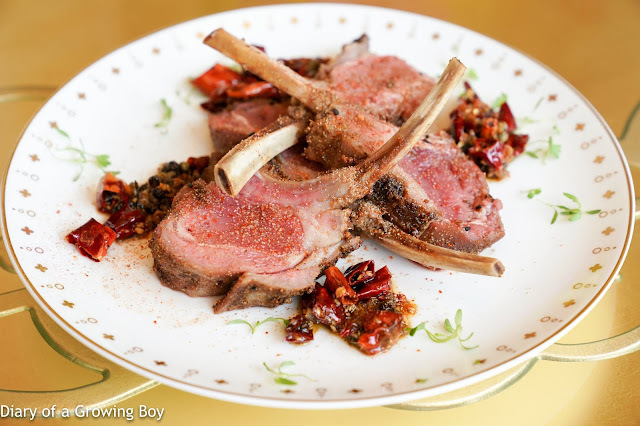 The seasoning is classically Chinese - with cumin, Sichuan peppercorns, and chili peppers. So you've got a little heat from the chili, some numbness from the peppercorns, and additional exotic fragrance from the cumin. Loved it. 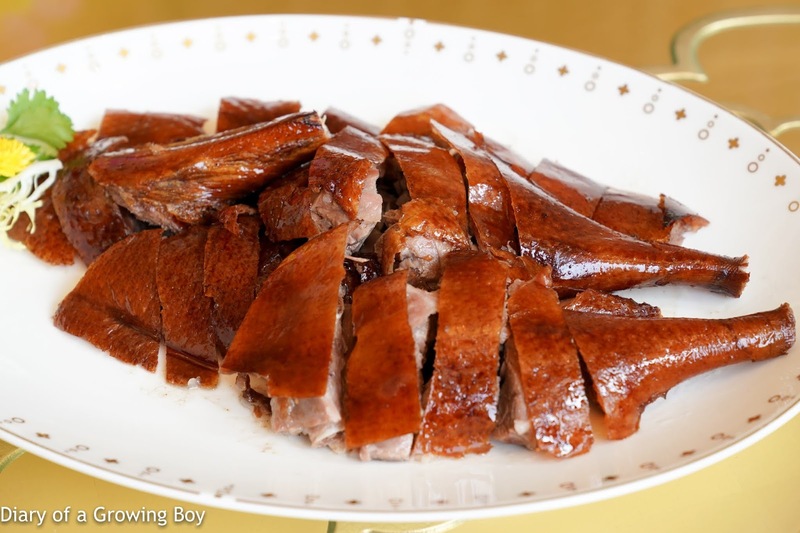 Lychee wood roasted goose (果木燒鵝) - Chef Tam said that the oven he had installed for roasting was still new and being "seasoned", and probably wouldn't reach optimal condition for another month or so. But I don't think any of us were complaining about the quality of the goose today... especially that paper-thin skin. 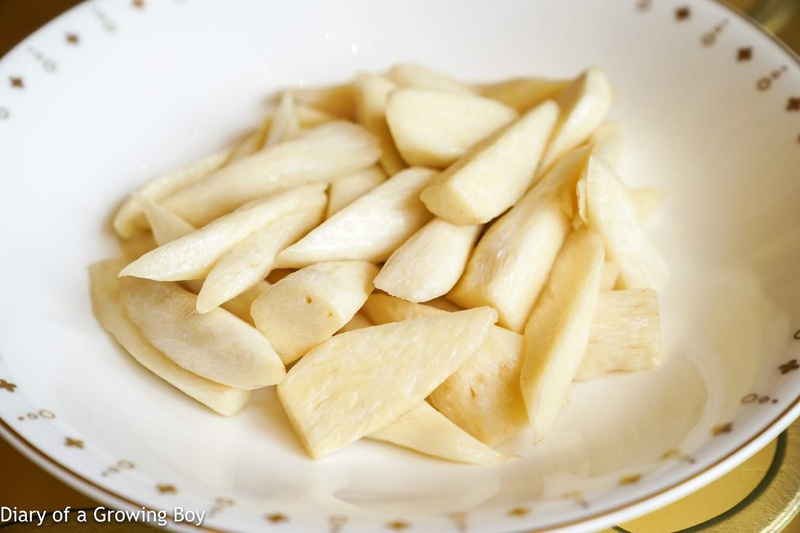 Stir-fried water bamboo (清炒茭白) - one of my favorite veggies since childhood, and so happy to have the tender bamboo today. White water snowflake (水蓮) - I was so surprised to see this here... as I've never had it outside Taiwan. 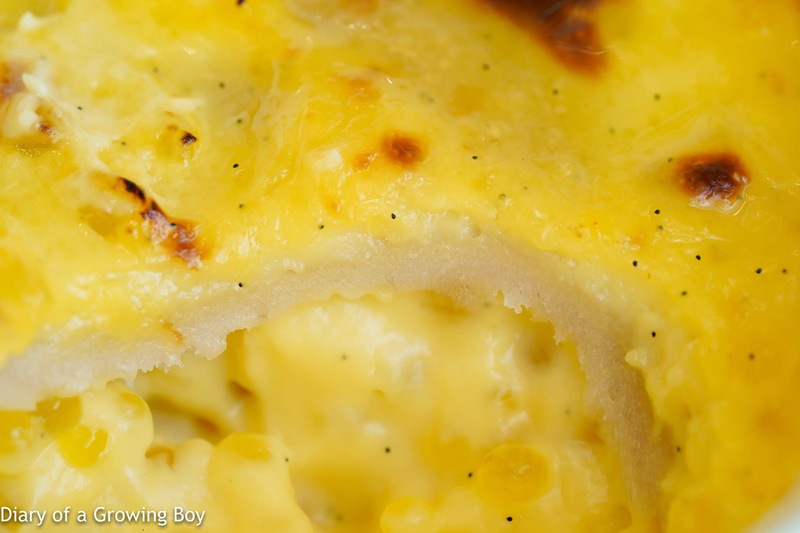 So crunchy. So different from the water bamboo. So happy. Suckling pig filled with pilaf (金陵乳豬飯) - we knew we would be getting one of Chef Tam's signatures today, and frankly this was the one dish I was most looking forward to. The result for the "suckling pig maki" today wasn't 100%. 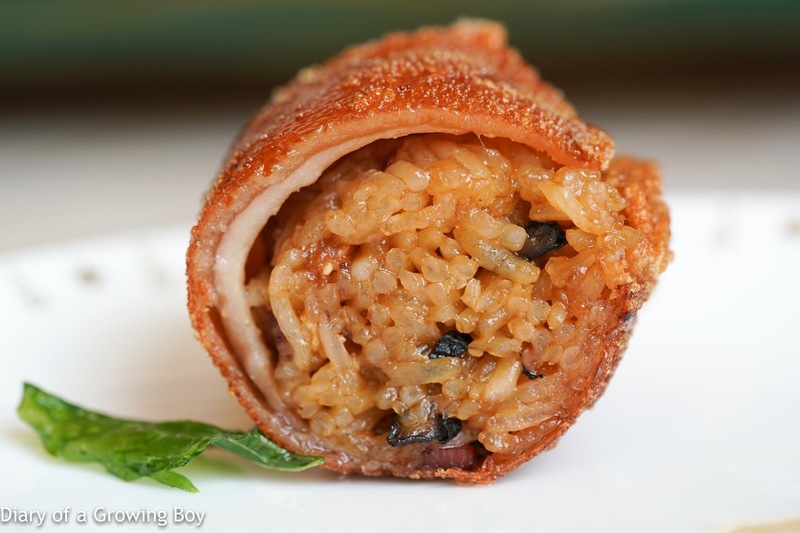 Yes, the crackling was as crispy and delicious as ever, but the glutinous rice stuffing was a little too wet and mushy. I guess there wasn't enough time to air-dry it first. I also felt it to be a little under-seasoned. Still very, very delicious and made everyone happy. 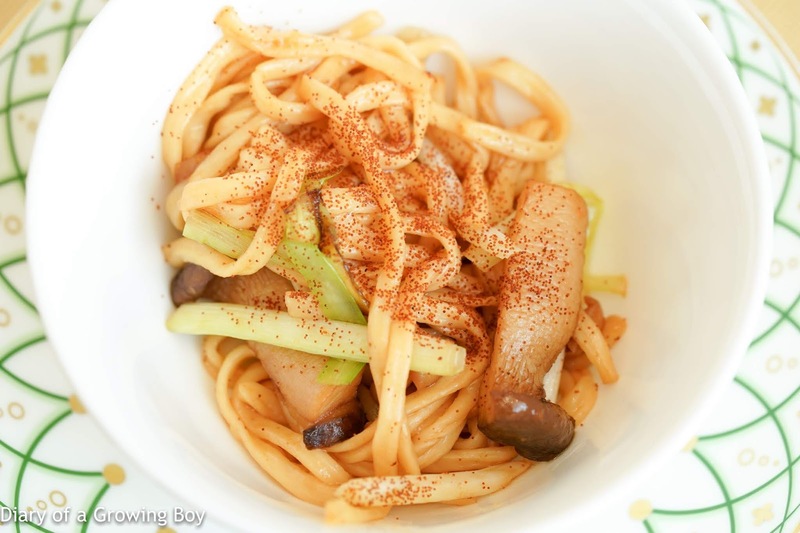 The final savory dish was stir-fried matsutake mushrooms and white asparagus. 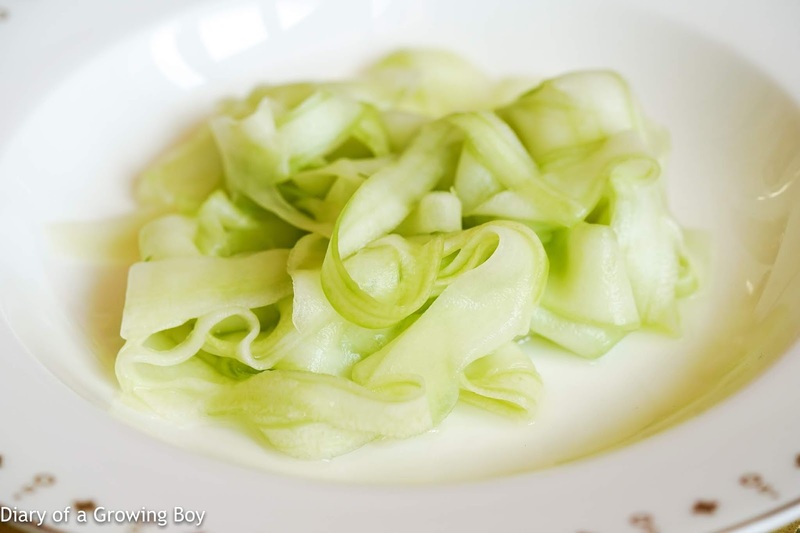 Chef Tam simply let the ingredients speak for themselves. Chef Tam came and asked if everyone was full, and whether we needed more food. Aaaaaand The Man in White T-shirt decided that he would like to have a little more... which is why we ended up with e-fu noodles with mushrooms and shrimp roe (野菌蝦子伊麵). 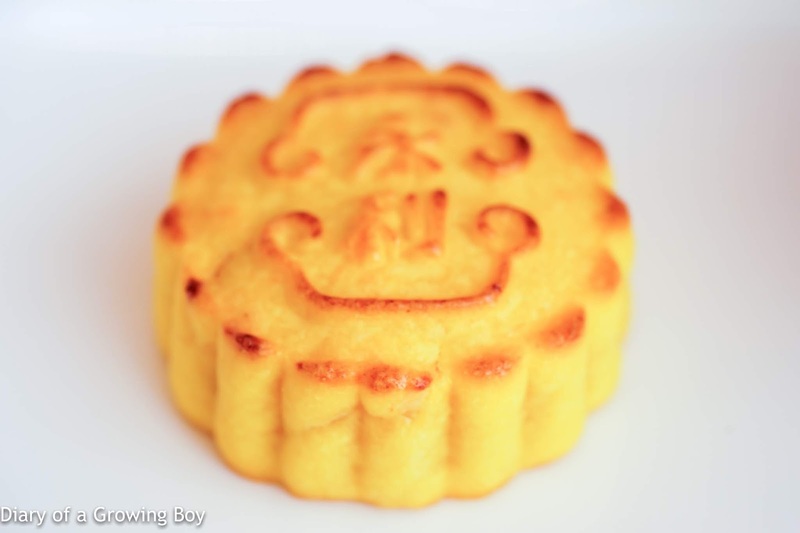 We were presented with a duo of sweets, the first of which was a custard mooncake (奶皇月餅). Pretty good, actually. 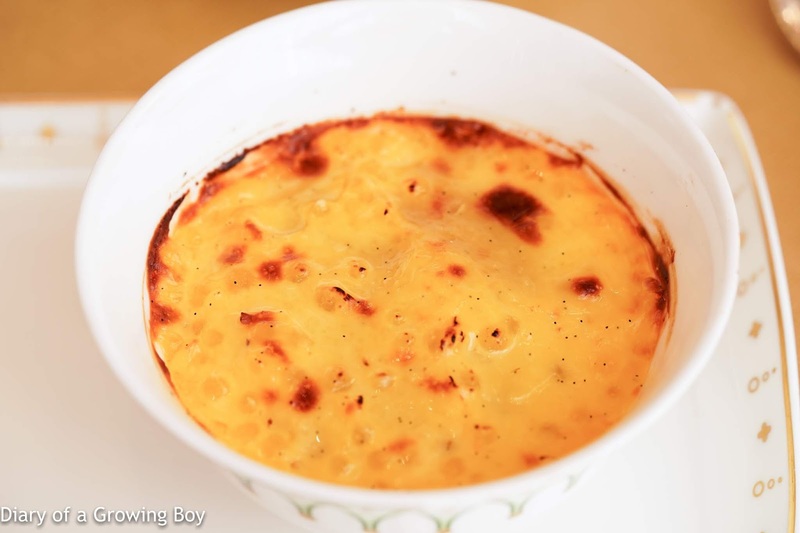 Sago pudding (西米布甸) - with a layer of taro near the top. I managed to carry one magnum of wine to lunch today and the 11 of us shared it. I knew it would take a while for the wine to open up, so I instructed the staff that no one was to get any wine. Well... the staff ignored my instructions after a while and decided to pour the wine without my approval anyway. They didn't seem to care that I was the owner of the wine, and they should listen to me. They only knew that glasses were sitting empty and they thought they were doing their jobs by filling the glasses... without any regard to whether a wine was actually ready to drink. 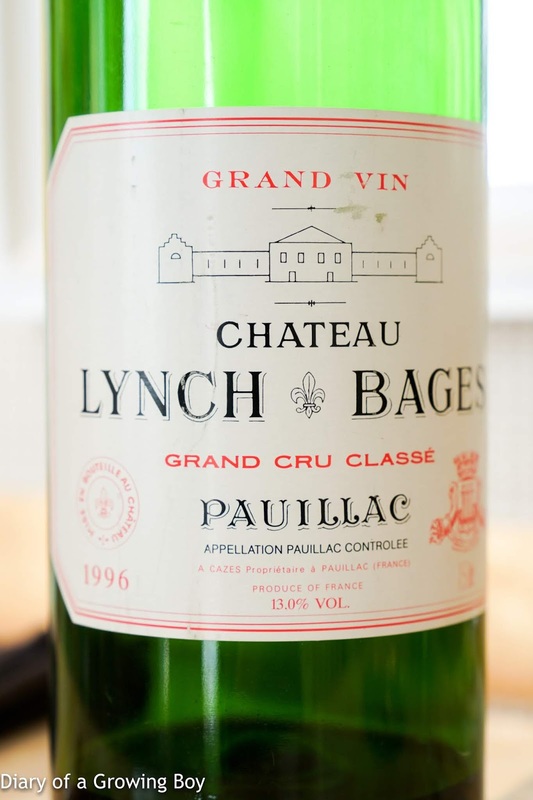 1996 Lynch-Bages, en magnum - served half an hour after decanting. One hour after decanting this was very smooth on the palate but needed to be chilled. Showed much better after two hours. In spite of the service fail on the wine, this was an absolutely fantastic meal. Quite a few revelations for me today, and I very much look forward to coming back after Chef Tam has settled in a little more.